Last year, I attended the Weaving History Conference for the first time. I also had the honor of being invited to speak about sakiori at the conference, despite the fact that the theme last year was lace! 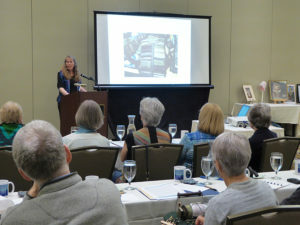 The conference was educational, enlightening and entertaining, and I met many wonderful weavers and textile enthusiasts. I had a great time speaking to such an enjoyable and interested audience! One fellow attendee and speaker was Sally Orgren, who many weavers know from her activity on Weavolution and the Ravelry Warped Weavers group, and who is currently serving as editor of the Handweavers Guild of America’s journal, Shuttle, Spindle & Dyepot. Because I was so busy last year with other weaving-related activities (to be named later), I asked Sally if she would write a brief post about the conference. Although I did not manage to publish it in a timely fashion (cough, cough), this is also an appropriate time to get it out to you, since it is now registration time for this year’s conference, 50th Anniversary Retrospective, to be held Thursday, May 18-Friday, May 19th in Clayton, NY. To find out more and register, please visit the Thousand Islands Arts Center website. The Weaving History Conference is hosted annually by the Thousand Islands Arts Center (home of the Handweaving Museum) in Clayton, New York. It took the recommendation of three different weavers before I finally succumbed to my curiosity and signed up. Having attended at least four conferences now, I totally agree with Michigan weaver Mary Underwood’s assessment, “If you miss the Weaving History Conference, it is like missing Christmas!”. Each year, the theme of the conference changes, but attendees can count on interesting presentations that encompass the production of textiles from historians, industrial professionals, and contemporary practitioners of these “life skills” from the past. The attendees are just as interesting as the presenters, and the intimate setting at the Thousand Islands Harbor Hotel allows for wonderful opportunities to get to know everyone. 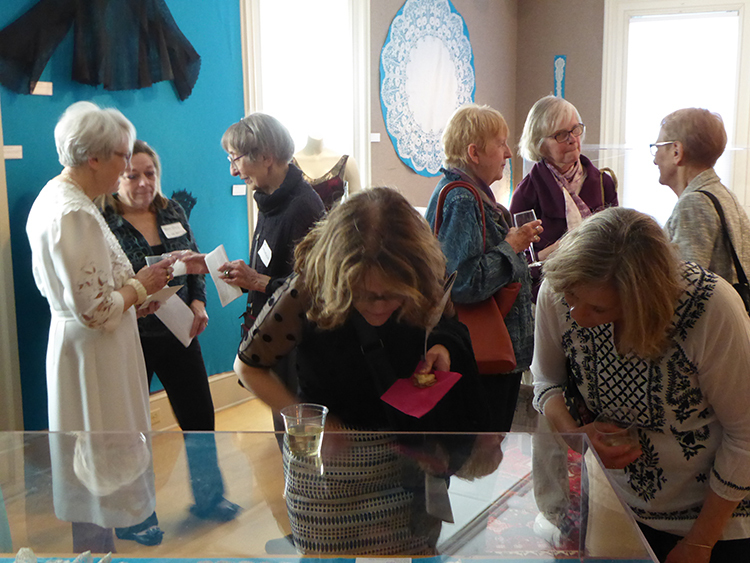 Meeting and mingling: Curator Emerita Sonja Wahl (wearing a white lace dress), talking with weaver Nell Znamierowski as other attendees enjoy the exhibition. The theme of this year’s conference was lace. We were treated to extraordinary samples of needlepoint laces, Lacis, and pillow or bobbin laces in the exhibition area of the museum. Between lace presentations, alternative topics were interspersed such as an exploration of sakiori, coverlet patterns, old looms, and a vintage (19th century) draft book and dye book. 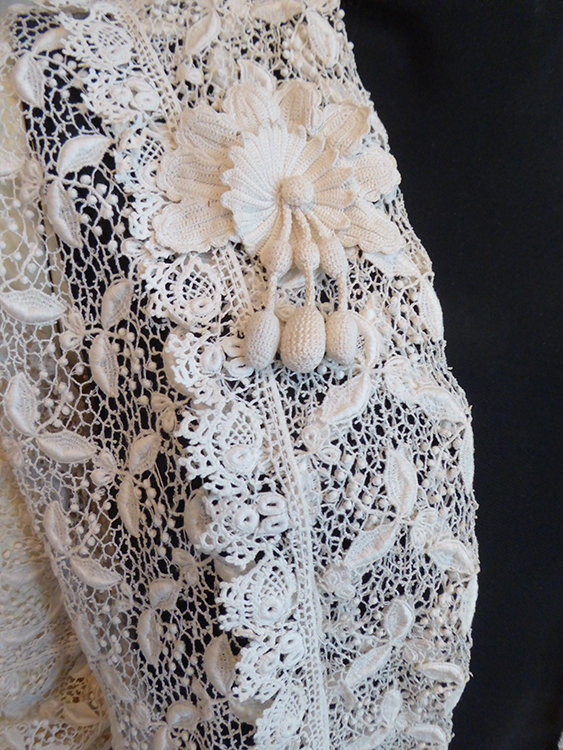 Detail from one of the lace samples on display in the exhibition, “The Allure of Lace”, at the Thousands Islands Arts Center. 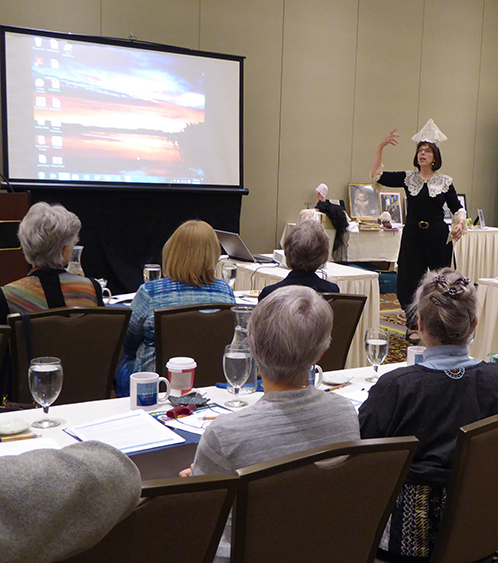 Deborah Yedziniak demonstrates how lace was worn as she described who was wearing lace. I am always inspired and invigorated by the dynamics of this conference, but I should mention the frosting on the cake is accessing the library that is affiliated with the Weaving History Museum. 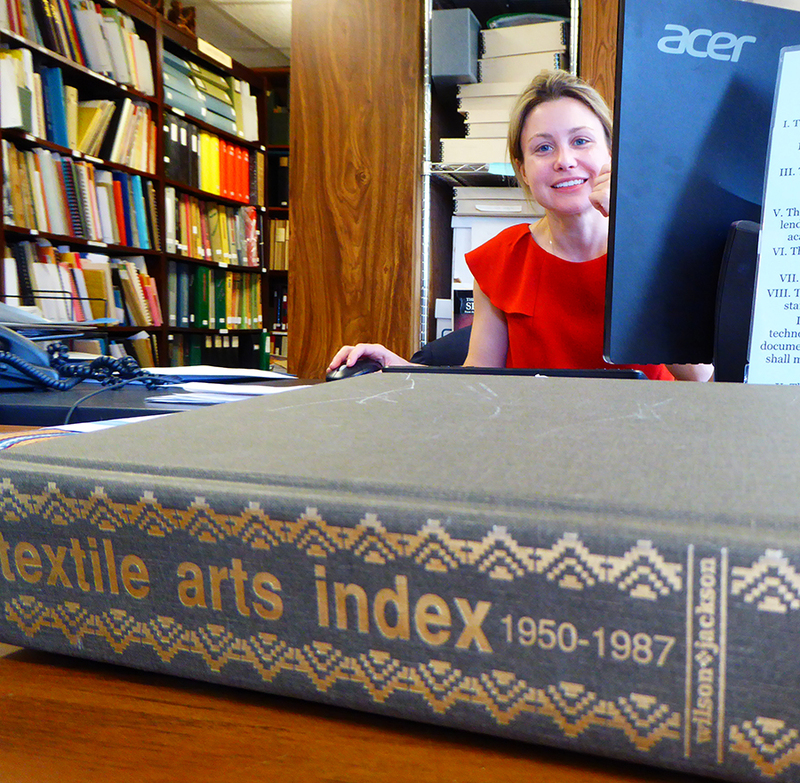 Comprising textiles, textile books and publications, many attendees allow an additional day before or after the conference to investigate topics of their own interest. Who knows? Sometimes these pet projects become future presentations. Curator Jessica Phinney in the library of the Handweaving Museum at the Thousand Islands Arts Center. Save the date! The 23rd annual conference will be held May 18-19, 2017. More importantly, the event coincides with the 50th anniversary of the Thousand Islands Arts Center, so I expect no less than a fabulous experience, yet again.